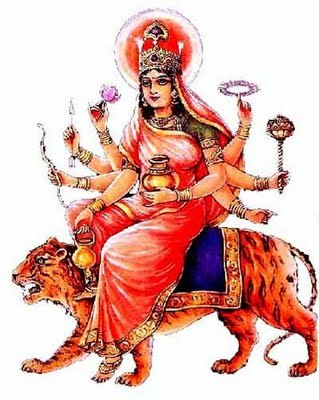 Navratri, Navaratri, or Navarathri (Sanskrit, Hindi, Marathi, and Nepali: नवरात्रि, Bengali: নবরাত্রি, Gujarātī: નવરાત્રી, Kannada:ನವರಾತ್ರಿ,Telugu : దుర్గా నవరాత్రులు , Malayalam: നവരാത്രി, Tamil: நவராத்திரி) is a Hindu festival of worship of Shakti and dance & festivities. The word Navaratri literally means nine nights in Sanskrit, nava meaning nine and ratri meaning nights. It is celebrated during the period of Sarad Masi Aswin by Hindu lunar calendar, all eight days and nine nights have its importance and is divided into sets of three days to adore three different aspects of the supreme goddess or goddesses. Nine Goddesses of Navratri are collectively known as Navdurga and are mentioned in the Devi Mahatmya and Durga Saptashati. 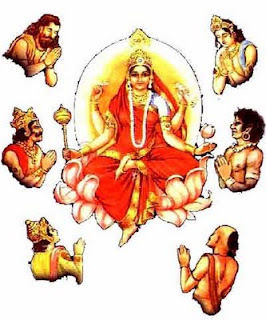 The Nine Goddesses worshipped on each nine-day of Navaratri are incarnations of Goddess Shakti. 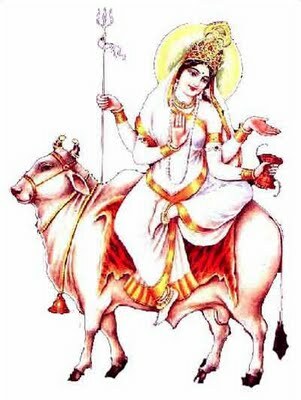 The nine goddess worshipped are Shailaputri, Brahmacharini, Chandraghanta, Kushmanda, Skanda Mata, Katyayani, Kala Ratri (Kaalratri), Maha Gowri and Siddhidayini. Shailaputri is believed to be the rebirth of Sati, the daughter of Daksha and the wife of Lord Shiva. In her second birth she is Parvati, the daughter of Himalaya and later she became the consort of Shiva. This is one of the very first forms of Shakti and is closely associated with Lord Shiva. Here Brahma means 'one who constantly meditates on the Supreme Being'. Brahmacharini is highly pious and is a peaceful form or is in meditation. She is also known as Tapashcharini, Aparna and Uma. This form of Durga is related to the severe penance undertaken by Sati and Parvati in their respective births to attain Lord Shiva as husband. Some of the most important Vratas observed in different parts of India by women is based on the strict austerities followed by Brahmacharini. Her name Chandraghanta comes from the crescent moon worn by her on the head. This is a terrible aspect of Goddess Shakti and is roaring in anger. 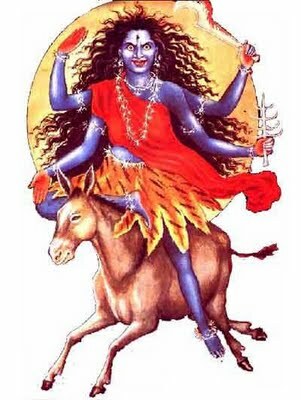 This form of Durga is completely different from earlier forms and shows when provoked she can be the terrible or malevolent. The name Kushmanda consists of three words. 'Ku' means 'a little', 'Usma' means 'energy' and 'Anda' means 'the cosmic egg or universe.' She is also known as Ashtabhuja. Goddess Shakti is very happy in this incarnation and it is believed that the eternal darkness ended when she smiled. And this led to the beginning of creation. Skanda is one of the names of Subrahmanya or Lord Muruga or Kartik – the General of the Army of the Devas and the most handsome God. 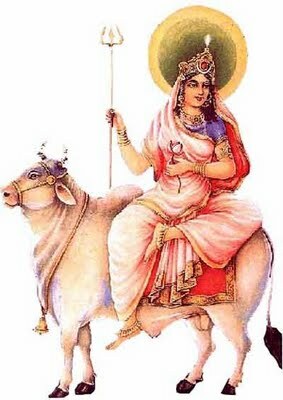 Skanda Mata is the mother of Kartik. She is also known as Padmasana. 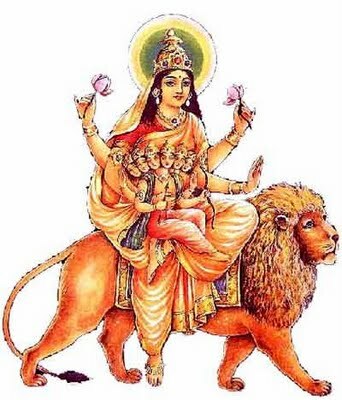 This the motherly form of Durga and she is benevolent. She is called Katyayani because she was born as the daughter of Sage Katya of Katya clan. This is the daughter form of Durga. Here is she a loving daughter. She is epitome of love but won't hesitate to rise up in anger to defend righteousness and Dharma. Kalaratri is the one who destroys ignorance and removes darkness. She is also known as Shubhamkari. 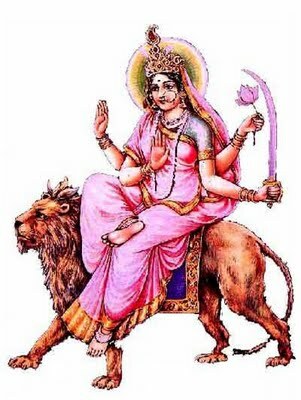 In this form she is believed to have licked the blood of demon Rakta Beeja who had the capacity to bring out thousand demons from a drop of blood spilt from his body. This is the most violent form of Durga. This form primarily depicts that life also has dark side – the violent Mother Nature and creates havoc and removes all dirt. Mahagauri means one clean and bright like a ray of lightning. This is the form of Mata Parvati when she did penance to get Shiva as her husband. It is believed that due to the intense Tapas performed by her without moving caused soil and dust to collect on her body. Lord Shiva cleaned her with water from Ganga. Purity is depicted in this form of Durga. In this form Mother Goddess provides 'Siddhi' or knowledge. In this form Durga removes ignorance and she provides the knowledge to realize That or Brahman. She is surrounded by Siddhas, Gandharvas, Yakshas, Demons and Gods who are worshipping her. The Siddhi that she provides is the realization that everything is Supreme Being or Brahman. 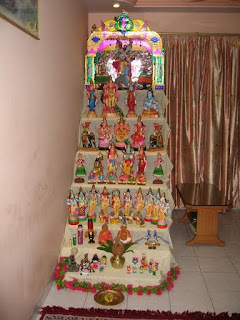 For the initial six the Pooja celebrations are limited to home. The celebrations acquire a festive form since the seventh day when the festivities of Navratri surround the atmosphere. 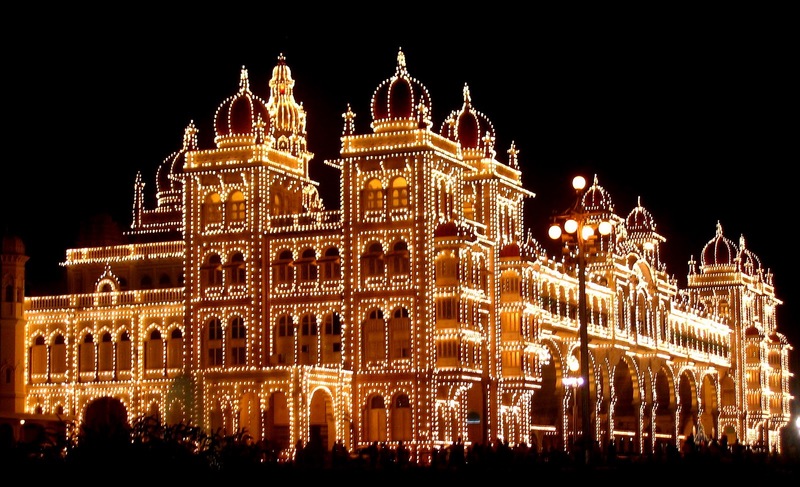 The festivities culminate on the tenth day, called variously Vijayadashmi, Dushehra when people in most parts of the country burn effigies of Ravana, Meghanatha and Kumbhakarna. Some people fast on all nine days, eating only fruit and milk dishes. Some fast only on the eighth or/and ninth day. As the festival is dear to the mother goddess, on the eighth or ninth day many people invite over nine young girls from the neighborhood. These girls are treated as the goddess herself. People ceremonially wash their feet, worship them and then offer food to the "girl-goddesses". On the first day of the Navaratras, grains of barley are planted in the puja room of the house. A small bed of mud is prepared in which barley seeds are sown after a small puja has been performed. Every day some water is sprinkled on it. On the tenth day, the shoots are about 3 - 5 inches in length. After the puja, these seedlings are pulled out and given to devotees as a blessing from god. The seedlings are placed on their caps, behind their ears, and inside books to bring good luck. This custom suggests a link to harvesting. The sowing and reaping of barley is symbolic of the "first fruit". Soon after this festival, the sugarcane crop is harvested and the winter crops are sown. Mahishasura, the mighty demon, worshipped Lord Shiva and obtained the power of eternity. Soon, he started killing and harassing innocent people and set out to win all the three lokas. The gods in swargaloka appealed to Lord Shiva, to find a way to get rid of the demon. To protect the world from the atrocities of Mahishasura, the Trinity of Brahma, Vishnu and Shiva united their powers and created a divine female warrior, known as Goddess Durga. Mahishasura, when he saw the divine beauty of Goddess Durga, got mesmerized. So fascinated was Mahishasura by Goddess Durga's beauty that he approached her with the intention of marriage. The goddess agreed to marry him, but put forth a condition - Mahishasura would have to win over her in a battle. Mahishasura, proud as he was, agreed immediately! The battle continued for 9 nights and at the end of the ninth night, Goddess Durga beheaded Mahishasura. The nine nights came to be known as Navratri, while the tenth day was called Vijayadashmi, the tenth day that brought the triumph of good over evil. The origin of this custom can also be traced to the Ramayana. According to it, Rama had to pray to the nine different aspects of Devi to be able to kill Ravana. He then accumulated enough power to kill Ravana on the tenth day, which was called Vijayadashmi or Victory Day. Since then, the tradition of praying to Devi for nine days has continued and was especially pronounced amongst the Kshatriyas who believed that by doing so, they too would be able to defeat the most powerful enemy. 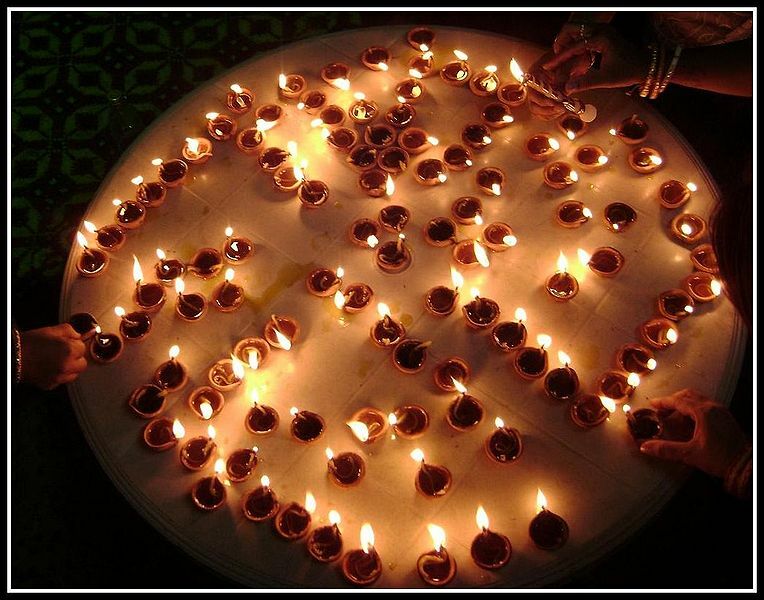 Today, it is celebrated more for its mythological significance and reaffirms the Hindu faith in the triumph of good. Even today, the nine different forms of the goddess are worshipped. Though several communities of Hindus are staunch vegetarians, Navaratri is one exception. On the eighth day, many communities, especially Gurkha and other hill tribes who are believers in the Devi cult sacrifice an animal. This blood sacrifice is a form of thanksgiving to the goddess for a wish that has been granted. People often sacrifice a buffalo symbolic of the killing of Mahishasura by Durga. 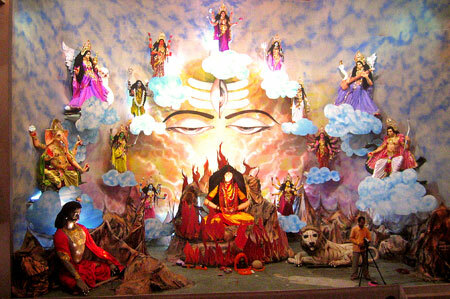 In Bengal, this period is celebrated as Durga Puja. 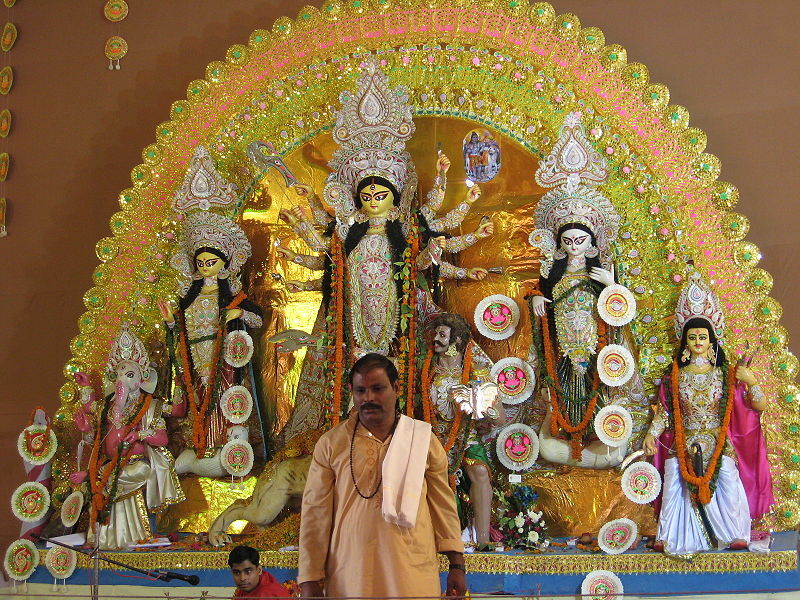 Groups and residents' associations in towns and cities erect beautiful marquees, where they install the idol of the Mother Goddess. In Calcutta, as also other places, there are competitions held and the most beautiful and creatively done marquee gets a prize. For all the nine days, the marquee becomes the center of all activity where cultural events and competitions are organized every day. 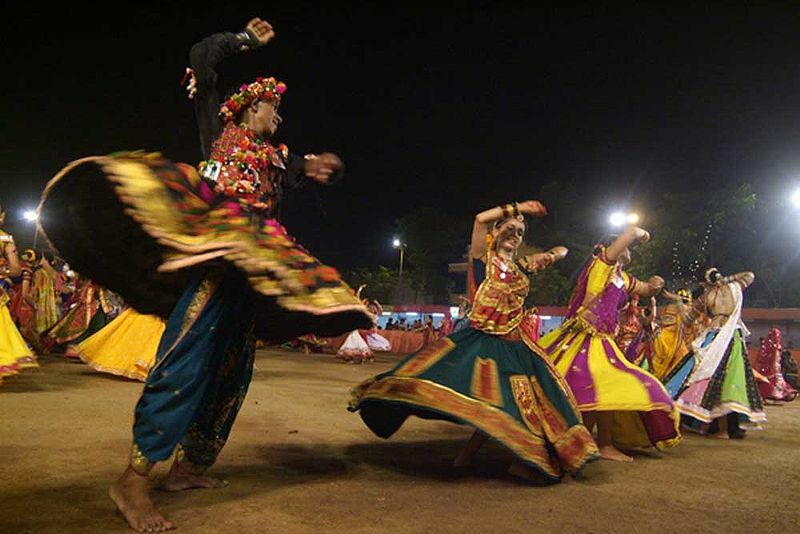 In Gujarat, this is the time for the joyous Garba and Dandia dances and people pour out at night to participate in this community festival. Women and girls in all their fineries dance around the garb a pot, clapping their hands in rhythmic movement. The pot is decorated with flowers, betel leaves, and has its mouth covered with a coconut. In Tamil Nadu, the first three days of the festival are dedicated to Lakshmi, the next three to Durga and the last three to Sarasvati. The nine-day celebration is compartmentalized in certain parts of the country, dedicating three days each to a trinity of goddesses: to Durga the goddess of valor, to Lakshmi the goddess of wealth and to Saraswati the goddess of knowledge. The tempo of life changes perceptibly in every family, in markets, in Mata's temples, long before the festival commences. 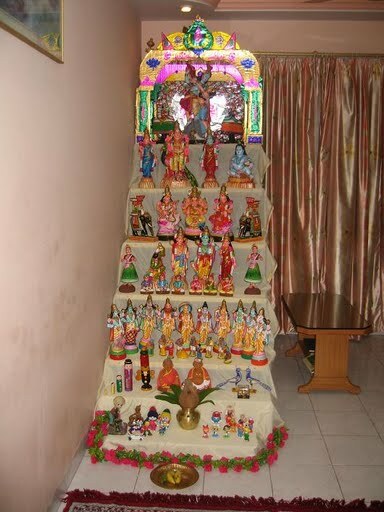 In homes, the corner or room reserved for puja becomes the scene of intense preparation. A coconut, saffron or sandalwood paste, a garba (perforated earthen pot), a kumbh (earthen pot), grains of wheat or barley, ghee (clarified butter) or mustard oil for a lamp that will burn incessantly all through the nine special nights, are placed in readiness for the ceremonial ritualistic initiation of the festival. Housewives draw designs and emblems with rice flour, turmeric powder-and vermilion. Each of the motifs symbolizes abundance and represents hope for the future. On the eighth and ninth days of the festival, yagnas are performed as a final act of farewell that marks the termination of the ceremonies. Ghee or clarified butter, a sweet concoction of rice cooked in condensed milk (paayas or kheer) and sesame seeds are traditional items used in the yagna to the chanting of mantras conveying the theme'"This is my offering to God". 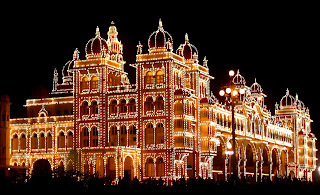 On the tenth day or Vijaya Dasami, more popularly known as Dussehra, enormous effigies of Ravana stuffed with firecrackers are torched with flaming arrows to the delight of throngs of revelers. People read "The Devi Mahatmyam" (Glory of Divine Mother) having 700 Mantras on Shri Durga Mata. During Navaratri, we invoke the energy aspect of God in the form of the universal mother, commonly referred to as "Durga," which literally means the remover of miseries of life. 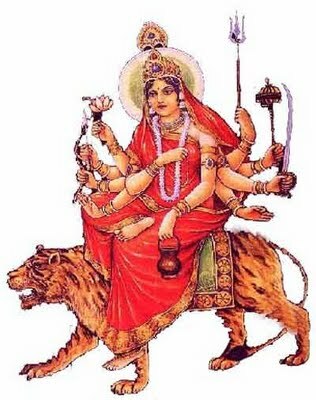 She is also referred to as "Devi" (goddess) or "Shakti" (energy or power). It is this energy, which helps God to proceed with the work of creation, preservation and destruction. In other words, we can say that God is motionless, absolutely changeless, and the Divine Mother Durga, does everything. Truly speaking, our worship of Shakti re-confirms the scientific theory that energy is imperishable. It cannot be created or destroyed. It is always there. Why Worship the Mother Goddess? We think this energy is only a form of the Divine Mother, who is the mother of all, and all of us are her children. "Why mother; why not father?" J Let me just say that we believe that God's glory, his cosmic energy, his greatness and supremacy can best be depicted as the motherhood aspect of God. Just as a child finds all these qualities in his or her mother, similarly, all of us look upon God as mother. In fact, Hinduism is the only religion in the world, which gives so much importance to the mother aspect of God because we believe that mother is the creative aspect of the absolute. We believe that it is the divine power that provides energy for the earth to move around the sun, causing the changes in the outer nature and that this divine power must be thanked for maintaining the correct balance of the universe. Due to the changes in the nature, the bodies and minds of people undergo a considerable change, and hence, we worship the divine power to bestow upon all of us enough potent powers to maintain our physical and mental balance. Why Do We Need the Power? J what I suggest that join your parents and friends in worshipping "Ma Durga", she will bestow on you wealth, auspiciousness, prosperity, knowledge, and other potent powers to cross every hurdle of life. Let us all take a resolve, this Navaratri, to spread peace, harmony and knowledge in this world and strengthen our commitment to making this world a better place.